The island acquired the name in 1676 when Louis XIV populated the island with beautiful white swans. By the end of the 17th century the smaller islands were connected to the larger making one island. 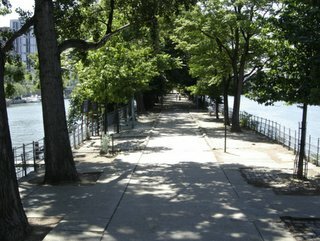 The Path of the Swans, the Allee des Cygnes, is not a long walk, only 850 meters. 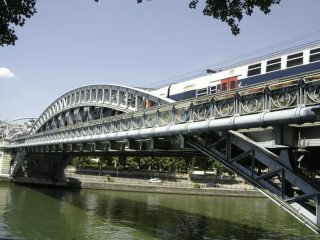 It extends between two bridges (ponts), the Pont de Bir-Hakeim, on the east end and the Pont de Grenelle on the west. 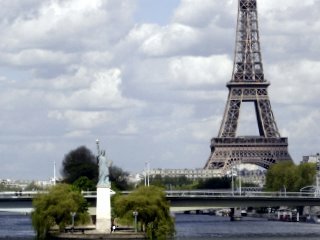 To begin this walk from Pont de Bir-Hakeim, take the RER to the Champ de Mars-Tour Eiffel station. This is the same RER station one uses to go to the Eiffel Tower. The Pont de Bir-Hakeim is a few steps westward (left) from this station. 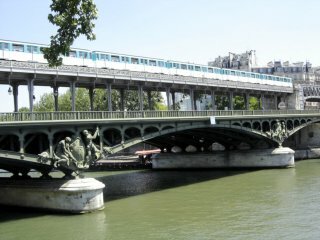 Or, one can take the #6 Metro line and get off at the Bir-Hakeim station, which places you right at the bridge. This Metro station is also the one to use for reaching the Eiffel Tower. To reach the Path of the Swans, you must walk halfway across the bridge. The Pont de Bir-Hakeim is 257 meters long and 25 meters wide. It was built between 1903-1905 by engineer Louis Biette and the architect Jean-Camille Formié and accommodates car traffic, pedestrians and the Metro. 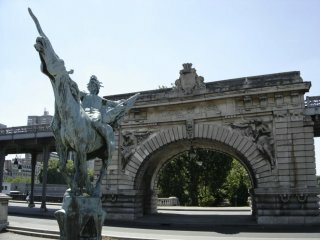 The bridge is named for the battle of Bir-Hakeim in the Libyan desert during World War II where the French troops defeated the armored tanks of Rommel. It was the first significant victory of the Free French Army. 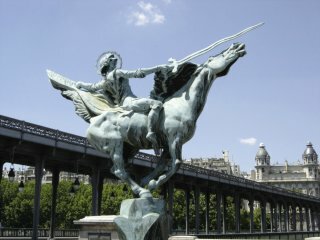 On the east side of Pont de Bir-Hakeim is a striking statue of a young man, with a thrusting sword, atop a horse that seems ready to fly out over the river. 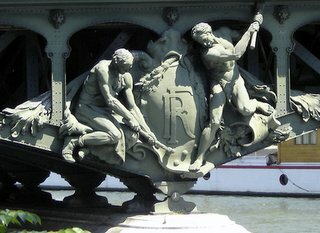 The statue is called, "La France Renaissante", or "France Reappearing". It was created by the Dutch sculptor Wederlink and offered by the Danish colony of Paris in 1930. There are steps leading down from the bridge to to the Allée des Cygnes that pass under the arch of the old Passy Viaduct which was built in 1878 and which the bridge Bir-Hakeim replaces. 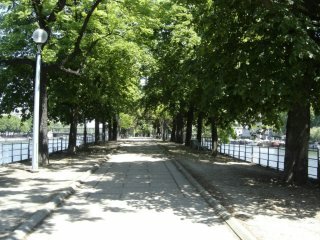 The Allée des Cygnes is a paved, tree-lined walk-way with many benches. One can still hear the sounds of the city traffic, but they are muted, in the not-so-far-distance. It's about as far from the city as one can get while still being in the city. It's a popular promenade for families, the elderly, joggers and people with dogs. Boats of all descriptions go by on both sides of the island. 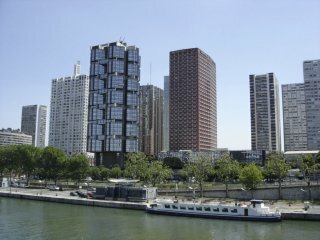 Boats are moored along the Left Bank (south side) in front of Beau Grenelle, a modern inner-city styled housing and business complex. 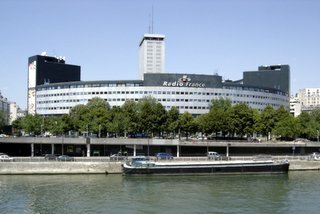 On the Right Bank (north side) is found the circular shaped home of Radio France. At almost mid-point on the island the City does invade just a bit. There is a small viaduct, a trestle, that allows the passing of the RER train. At the west end of the Allée is an exact replica (though smaller at 35 feet high) of the Statue of Liberty. 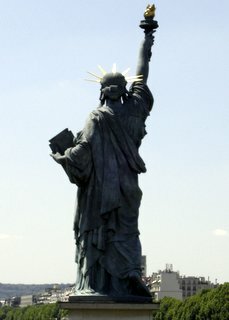 This statue was donated and erected by Americans living in Paris on July 4, 1889. Here are stairs leading up to the Bridge Grenelle. By turning left (south) on the bridge and crossing quai de Grenelle on rue Linois you will soon come to Place Charles Michel where you'll find the Charles Michel Metro station on line #10.